The church developed in the book of Acts as the gospel spread throughout the regions. As a follow-up to yesterday’s post – should we invite unsaved friends to church? – I want to examine the gatherings of the assemblies in the book of Acts over the next few posts. It is important to look at the gatherings to see if reasonable conclusions can be drawn about whether or not unbelievers are present in some of the assemblies of believers, no matter where they meet. I recognize that Acts tells the stories of the gospel expansion, and Luke’s purpose is not to give us a definitive answer to the question I ask. The church is an organization that is in development in the book of Acts, where people meet in homes, in the public square, in the market place. Meeting in a church building is not a development in the history of the church until much later. The church now has developed from house gatherings of believers we see in Acts, to organized gatherings for the worship of God and the proclamation of the gospel, sometimes in buildings dedicated to that purpose. In some sense, it is an apples to oranges comparison. The word church – as used in Acts – refers to the assembly of believers. As the writings of Paul come forth, the term develops a theological significance about the body of Christ. As systematic theology comes upon reflections on the entire NT, there is a distinction between the Invisible Church and the Visible Church. The invisible church is the church as God sees it – made up of every believer, every where. The visible church is a local expression of the body of Christ. Augustine referred to the church as a mixed body, a visible people, but this people has both tares and wheat, as described by Jesus. 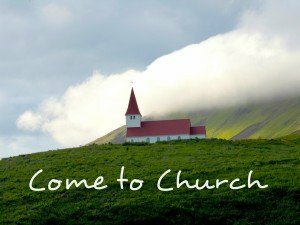 Since I don’t see a prohibition against inviting unbelievers to the gatherings, nor do I see a command to invite people to church, I realize that conclusions I draw are based on observations of how the early church might have done it, and then wonder if such patterns are prescriptive for all time, or descriptive of their time and place. I invite your commentary on these passages (save commentary on the future passages for future posts as I work through it). When the day of Pentecost came, they were all together in one place. Suddenly a sound like the blowing of a violent wind came from heaven and filled the whole house where they were sitting. They saw what seemed to be tongues of fire that separated and came to rest on each of them. All of them were filled with the Holy Spirit and began to speak in other tongues as the Spirit enabled them. Now there were staying in Jerusalem God-fearing Jews from every nation under heaven. When they heard this sound, a crowd came together in bewilderment, because each one heard their own language being spoken. On the day of Pentecost, the believers had gathered. When the Holy Spirit was poured out, non-believers heard and saw it. This lead to Peter’s sermon in Acts 2, upon with many people got saved. The first several sentences give a general overview of the practices of the Christian believers. They met together in the temple courts (public spaces), and in homes (more intimate gatherings). They enjoyed the favor of the people (visible evidence). The Lord kept adding to their numbers. What is not clear is whether or not those who are being added are already participating or not with Christians in their fellowship, meeting spaces, homes, as they come into salvation. After Peter and John were released, they returned to “their own people” and gave testimony. They then participated in a prayer meeting. Acts 4:31 reports “After they prayed, the place where they were meeting was shaken. And they were all filled with the Holy Spirit and spoke the word of God boldly.” This prayer meeting may or may not have been one of the assemblies, but it is a prayer meeting. Once again, Luke gives a summary of the gatherings and describes on aspect of how the Lord is working in the midst of them. The question I ask – are unbelievers present – is not an issue in this text. Great fear seized the whole church and all who heard about these events. Luke reports what happens when Ananias and Sapphira experience the judgment of God. It is also the first use of the word church to describe the growing group of believers. There is no evidence to the presence or absence of non-believers in this gathering. The believers would gather together in a public place – Solomon’s colonnade. People would bring their sick and receive healing and deliverance. A couple of points here come to mind. “No one dared to join them” likely refers to the initial subversive nature of the church – preaching a message that wasn’t popular against a government that didn’t like it. “Believed and were added.” Luke reminds us that you can’t be counted as a follower of Christ until you believe. Healing and deliverance – Luke doesn’t report on the salvation status of anyone of those who come. It seems to me that people were being invited to the gatherings in Solomon’s Colonnade in order to receive healing and deliverance. Evangelism Encounter: "I'd rather invite them to a manure shoveling party than to church."